Last week students at Discovery Montessori School celebrated International Peace Day. 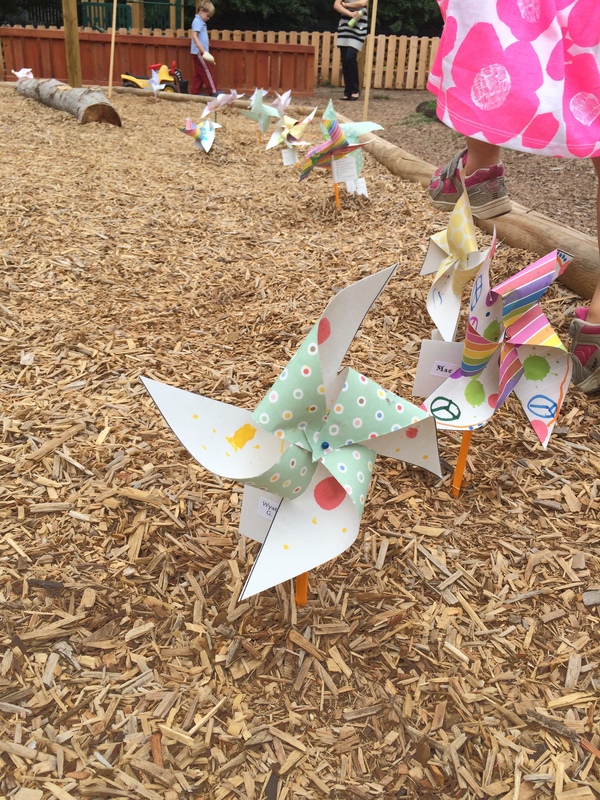 We participated in an art installation project “Pinwheels for Peace” and all of our students made their own pinwheel to plant in our garden. 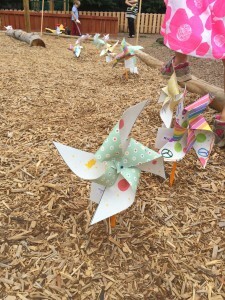 While making their pinwheels, children shared their thoughts about peace and what that means and included some keywords on their pinwheels. It was really sweet, but way more impressive than the events on International Peace Day is what happens each and every day in our classrooms. I have to admit. I was skeptical. I had seen the Peace Corners in Montessori classrooms and heard about the Peace Curriculum from the pros. But, could a group of 15 or more preschoolers really ever be described as peaceful? How was that possible!? (says the mom of only one preschool-aged child) Fast forward a few months and I am now one of Montessori’s biggest fans. Routinely I go up and down the halls of our school to check in with teachers, and I am not kidding when I tell you that I cannot tell which classes are inside until I get to the doors (which are always open) and look inside. It’s worth repeating. The classrooms are so calm and quiet that you can’t even tell there are children inside unless you are close enough to see them! So, how does it happen? Is there magic in the essential oils? Are children in a Montessori school just naturally more Zen than others? From what I have learned, there are several important factors working together to create and foster this kind of peaceful and productive learning environment. Montessori classrooms are known for being “prepared environments”. An incredible amount of time and thought goes into setting up the classroom in a way that allows children to work without a lot of help from their teachers and to follow their own interests. Additionally, Montessori teachers lead by example. The old adage “do as I say not as I do” does not apply in Montessori classrooms. Teachers make a real effort to ensure that they are modeling the behavior that they want to see and speaking to the children in a way that they want for them to speak to each other. They are masters at this and I assure you it isn’t always easy! Perhaps the most important example of how Montessori classrooms achieve a peaceful atmosphere is that it is a priority for the teachers, and often families who choose this approach for their children. Teaching kindness and positive social skills are a common thread that weave in and out of all aspects of the day from greetings, to collaborating to conflict resolution. For me as a parent this is invaluable. I feel like there is no better time to support and develop good social skills than when children are really young. Our culture is a busy one. Technology has allowed us to be available to almost anyone, anytime, anywhere. Often I fear this results in us not being present or fully-available to the people right in front of us, and they are the most important. Developing these skills takes practice just like any others and it seems like our kids may not have as many opportunities as we did when we were growing up. Also, by creating a peaceful classroom we create a more productive classroom and one that facilitates concentration and learning. We all learn best when we are relaxed and feel safe and secure. We learn better when we are not being bombarded with noise and too much busyness. It’s a rare win –win! 2015 Discovery “Finds” Toys For Play AND Learning!